« All I want to do is read. Eric Luper’s historical YA novel BUG BOY comes out on Tuesday, and I can’t resist a little book celebration for one of my critique pals. If you know , then you know he’s one of the nicest, funniest guys you’ll ever meet. If you’ve read his first YA novel, BIG SLICK, you know he can spin a timely, fast-paced gambling story like nobody’s business. Now there’s BUG BOY – a gambling story from days gone by that shows his talent for writing historical fiction as juicy and fast-paced as anything set in modern times. This is a book that’s going to make teen boys fall in love with historical fiction without ever knowing what hit them. 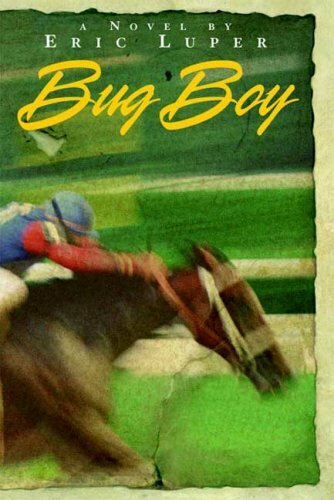 Set in 1934 Saratoga, BUG BOY is about an apprentice jockey who finds himself living the high life when his big opportunity comes knocking. But secrets from his past, pressure from a race course thug, and the attention of a beautiful young woman from the other side of the fence make his life more complicated than he could have imagined. One teacher note: BUG BOY is probably best for older middle school and high school students, since the realistic portrayal of rough track life includes some language and sexual situations. Actually, I’m betting that a bunch of adult readers are going to discover and love this book, too – it has incredible crossover appeal, especially for horse racing and history fans. If you need it right this very second (and you probably do) click here to buy it from an indie bookstore near you! Fascinating, gritty, and full of tension, BUG BOY is a sure win. Congrats, Eric! This entry was posted in Uncategorized and tagged book review, bug boy, eric luper. Bookmark the permalink. Both comments and trackbacks are currently closed.